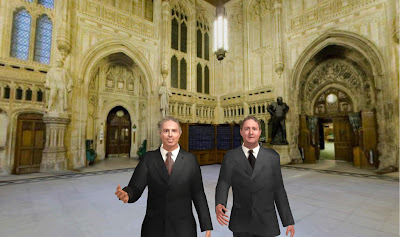 In response to this 'Serious Gaming' specialist Playgen have produced a political game called 'Serious Policy.' 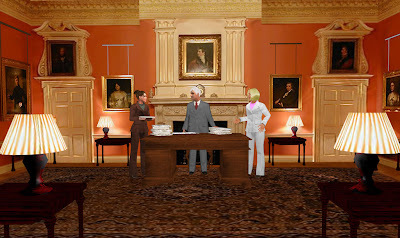 The Serious Policy game aims to demonstrate how political processes and decision making can be brought to life in an interesting way through a virtual world, whilst highlighting to players the importance of public engagement in the decision-making process. Serious Policy players are on a mission to win Treasury funding for a new project and along the way can irritate Alistair Darling, get advice from Tony Blair and get congratulated by Gordon Brown. 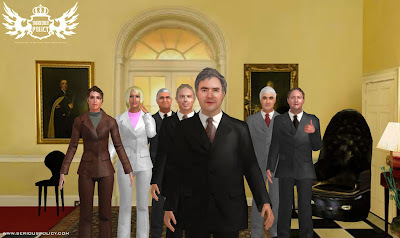 Serious Policy also has a variety of detailed game scenes including a virtual Members’ Lobby, a simulated Treasury and a digital Number 10. The Serious Policy Game took PlayGen Ltd only two weeks to make and cost less than £10K to develop. As business looks to virtual worlds to help with everything from cost effective meetings through to innovative training, Serious Policy is a good reminder that Gaming and Virtual Worlds can be creatively used for serious business and education as well as for leisure.